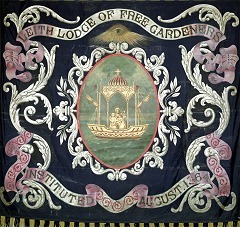 Lodges participated in all manner of public events. Over the course of time they acquired a wide variety of articles to signal their distinctiveness in public - banners, aprons and sashes were most common. They had traditions, many peculiar to each lodge, and attempted to fit their 'trade' into a wider story by drawing parallels with the original garden - Eden. Enthusiasts assembled a body of esoteric knowledge and ritual, borrowing freely from the example of freemasonry. They had a hierarchy of membership that was similar to freemasonry and based in Scotland's craft traditions. Members could pass through a sequence of three degrees - apprentice, journeyman, and master. 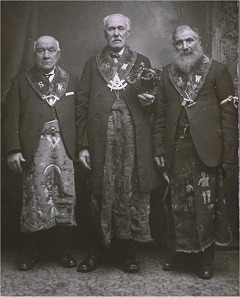 Members in good standing served as officers of each lodge (and later of the Grand Lodges). These posts were essentially democratically elected. Lodges made sure that members attended meetings by fining absentees. They also tried to regulate behaviour and keep the rituals of the lodge secret from non-members. At one time this would have been important for security or for practical purposes (to confirm a stranger was a real gardener). There were two main kinds of symbology in the free gardening movement. Some of the later symbology is overtly Masonic but older articles appear to express a true gardening tradition. 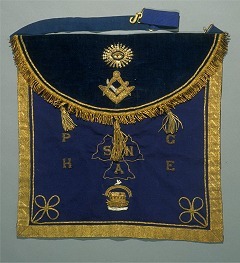 From the Masonic tradition come the all-seeing eye, compasses and square (crossed by a clasp knife) and Masonic-style short aprons, usually made of leather-backed blue cloth and trimmed with braid. The other tradition is horticultural. It is characterised by plants and produce (pineapples, grapes, flowers and, in particular, roses and thistles) and of working tools (crossed spade and rake, watering pans, reel and measuring line, and so on). Whilst this tradition shares ribbons, sashes and aprons with the former, their shape and decoration differ. Thus, aprons are full length, are usually made of dark blue serge and are often colourfully and fantastically embroidered. The differences appear to reflect an earlier tradition (the horticultural symbology) supplanted by a later accretion (the pseudo-Masonic); sometimes evidence from both can be seen in a single lodge or a single article.